These homemade sugar cookies make a fantastic treat in a lunchbox or as a treat as an after school snack after the first day of school. 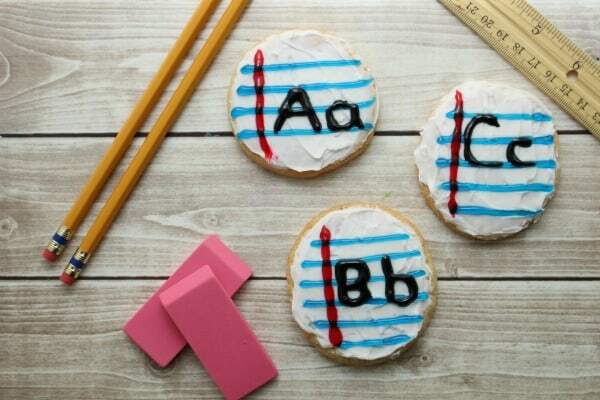 Sweet and simple sugar cookies take a fun new twist when you give them a school theme using just a couple basic grocery items to decorate them up. Write simple ABC's and 123's, your child's name, or simple sight words they are learning. 1. Preheat the oven to 375° degrees. 2. In a small mixing bowl, add your flour, baking soda and baking powder. 3. In a medium mixing bowl, cream the butter and sugar together until light and fluffy. 4. Add the egg and vanilla to the creamed butter and mix for one minute, to combine well. 5. Gradually add the dry ingredients and mix until fully incorporated. 6. Using a cookie scoop to create uniform sized cookies, form 12 balls out of the dough and place on a parchment-lined cookie sheet. 7. Bake for 10-12 minutes or until light golden brown. Cool for at least 2 hours on a wire rack. 8. Melt 1/2 cup of the white Wilton candy melts in the microwave for 60 seconds. Stir until completely melted. 9. Spread the melted candy on each sugar cookie and let cool for 20 minutes. 10. Take the blue gel tube and draw 5 lines across each cookie and let set for 20 minutes. 11. Take the red gel tube and draw a line down on the left side of each cookie. Let set for 20 minutes. 12. 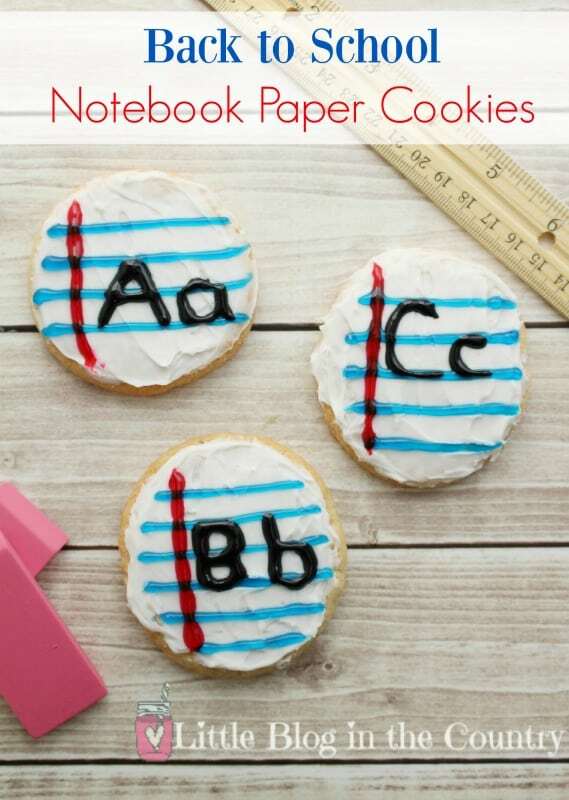 Take the black gel tube and write individual letters (uppercase and lower case) on each cookie. Let set for 20 minutes. Be sure to check out our Back to School Snack Mix too!